Goes great with bathroom decor. 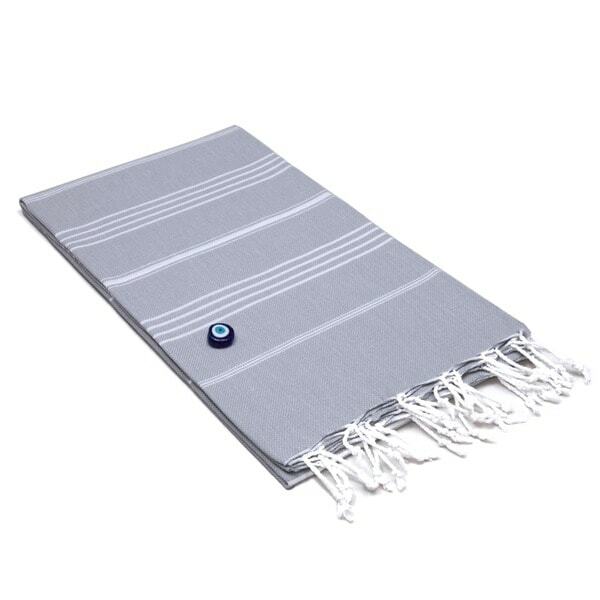 This oversized towel is ideal as a beach or bath towel, even a baby blanket or tablecloth. The striped pattern of grey and white is sure to accent your color schemes, while the hand woven construction adds durability. Crafted in Turkey, this stunning towel is made of 100 percent cotton. This pestemal, or traditional Turkish towel, is hand loomed and shipped in batches per loom, which may casue slight variations in color depending on the dye lot. These Turkish towels are all the rage and they make a great alternative to traditional towels. Surprised at how absorbent they are. You can use them for more than just a towel. I used one as a table cloth for an outdoor meal...so very versatile. Will definitely be getting more. I think this is nice. I'm a little taken back by the fabric. Although I have never purchased a Turkish towel until I bought this one and a few others on here, so I expected a thicker fabric. If you're not familiar with the thin fabric then you may be disappointed. Then again I am not certain if all are made thin or not. It's okay though. I purchased this to be used as a light weight throw on our sofa in the summer. It's small and light and serves the purpose but it isn't very soft. (rather stiff actually) Hopefully the more I wash it the softer it will get. its fine. I think in a climate that has mold it may be great as it dries fast. Im using it as a towel. it looks nice and is of fine quality. My niece uses towels like this and they ar much softer, which is what I was looking for. But its fine. Excellent product, it is the first time I use this kind of light weight towel.gets sorter and sorter.I loved them.I bought 5 different colors.Thanks overstock to bring this item for your customers. Great lightweight towel. Packs easy and dries quickly. Very pleased. They look even better in person. These are beautiful and will likely soften as they are washed. Soft, high quality, big. These are great!